If your group or organisation works with children or vulnerable adults, it may be necessary for paid staff and volunteers to undergo DBS checks (formerly known as CRB checks). 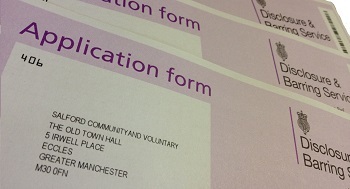 DBS checks are designed to help organisations from public, private and VCSE sectors to make safer recruitment decisions by identifying candidates who may be unsuitable for certain areas of work, especially those which may involve contact with children or other vulnerable members of society. How can Salford CVS help? Ensure compliance with the DBS’s code of practice. Salford CVS has also launched the quarterly Volunteer Expenses Fund to cover out-of-pocket expenses incurred by volunteers in Salford, your organisation may be eligible to apply to the fund to cover the cost of a DBS check. Find out about the Volunteer Expenses Fund. Applicants and employers can use the DBS update service to keep a certificate up to date or carry out checks on a potential employee’s certificate. This service is free to volunteers and for paid workers, the subscription costs £13 per year. A DBS check has no official expiry date. Any information included on a check will be accurate at the time the check was carried out. It is up to an employer to decide if they think a new check is needed. For full guidance on the Disclosure & Barring Service please click here. Information on who the DBS are and what they do can be downloaded from here. The ID required for DBS checks has changed slightly (as of January 2018) find out what documents you can use as ID here. There is also guidance on when and how an organisation should make a referral to DBS following an individual being permanently removed from regulated activity. Download from here. It can be difficult to determine if a DBS check needs to be performed, and at what level, the DBS have produced a case study with three examples to help clarify. Download from here. 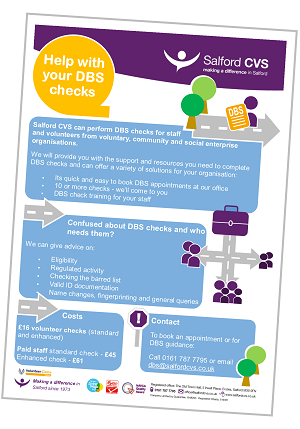 For advice and guidance or to apply for a DBS check please call 0161 787 7795 to book an appointment or email dbs@salfordcvs.co.uk for further information.